Want to catch disco fever, and party hearty through the life of the glamorous, treacherous former Philippines first lady Imelda Marcos? The show originated at New York’s Public Theater in 2013, and was also presented in London. This restaging is its first U.S. regional run, and a big gamble for a company with ongoing financial challenges. by David Byrne and Fatboy Slim. Through June 18, Seattle Repertory Theatre; $20 lottery-$130 (206-443-2222 or seattlerep.org). My guess? It will likely pay off, certainly in audience enthusiasm. It’s a fascinating, one-of-a-kind spectacle, teetering between searing docu-history and Warhol-esque camp. 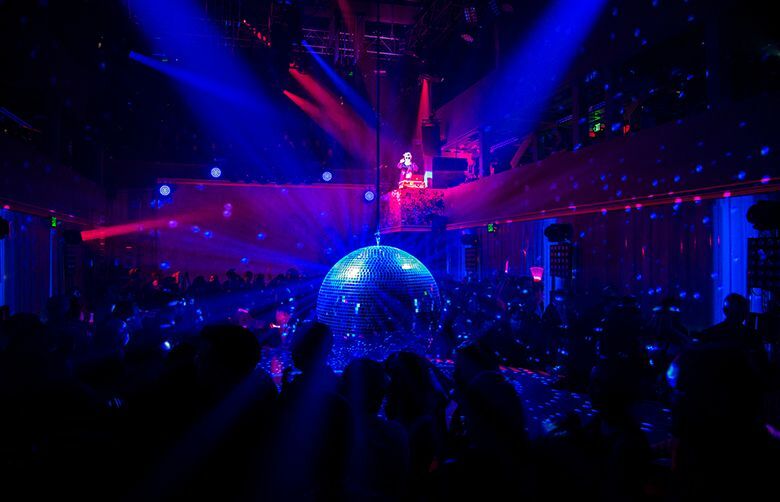 At times, the unequal balance between Studio 54-style bacchanalia and national tragedy can feel trivializing. But the physical production is flat-out terrific. The Rep has transformed the proscenium, 850-seat Bagley Wright Theatre, into a 1970s-style Manila discothèque with a big dance floor, a queen-sized disco ball, and wraparound video projections of archival news images, pulsating neon lights and singalong lyrics. There’s seating in a raised gallery that gives a bird’s-eye view of the action. But for the full immersive experience, most patrons do a stand-up boogie during the 90-minute show. At a Public Theatre performance, and here too, I joined the swirling, ramped-up floor crowd to be gently but firmly corralled by helpers between two mainstages and a series of mobile ramps as the action shifted constantly. This dynamic environment, designed by David Korins, is brilliantly traffic-managed here by the show’s original director Alex Timbers, a leader in immersive theater. And the idea is to seduce you — just as the beautiful, charismatic Imelda and her strongman spouse Ferdinand Marcos seduced a nation (only to utterly betray it). “Here Lies Love” does chronicle in vivid shorthand the corruption and brutality leading up to Manila’s peaceful 1986 People Power Revolution, which overthrew a regime that had bankrupted and oppressed the Philippines over two decades. But some advance knowledge of the period is advised, because ex-Talking Heads member/musical polymath Byrne and British deejay-musician Fatboy Slim focus most intently on the glossy political stagecraft and manipulative narcissism that went into the making of Imelda, world superstar. Played in stirring voice and with great hauteur by Jaygee Macapugay, this poor, gushingly innocent small-town beauty queen transforms herself into an enchantress of leading Filipino politician Marcos (a magnetic Mark Bautista). As first lady, she publicly mouths clichés about her great love and concern for “the people.” But as riches accrue, Imelda becomes a bejeweled globe-trotter, hobnobbing with celebs and world leaders from Chairman Mao to Richard Nixon, as well as a compulsive shopper (2,000 pairs of shoes? ), and, finally, a dictator’s consort demanding blind devotion from those her husband oppresses. The music, the outgrowth of a 2010 concept album, flows throughout the action. It is a melodic, listener-friendly, mostly danceable blend of disco techno-beats and ballads, with lyrics veering between the ironically sappy (Imelda: “The most important things are love and beauty”), and politically compelling broadsides from Marcos’ political opponent Ninoy Aquino (excellent Conrad Ricamora). The singing is live; backing is mostly recorded. Particularly effective, musically and visually, is a female chorus that embellishes many numbers with point-on vocals and choreographer Annie-B Parson’s stylized dance moves. They’re also gorgeous, and fetchingly costumed by Clint Ramos, whose gem-toned satin outfits for Imelda befit a self-appointed empress. 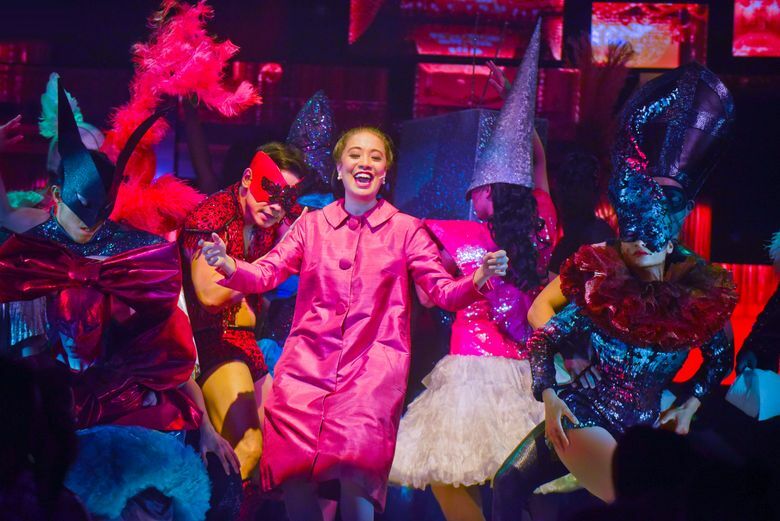 There are obvious parallels between “Here Lies Love” and Andrew Lloyd Webber’s “Evita,” a 1970s concept-album-turned-musical about another superstar wife of a dictator, Argentina’s Eva Peron. 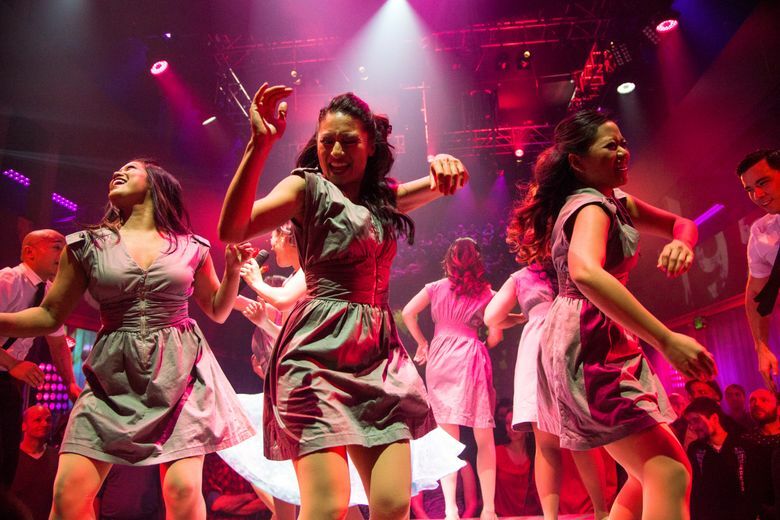 But while “Evita” was a pop-opera prototype with more memorable songs, “Here Lies Love” innovates as a physically engrossing, participatory theatrical event complete with line dances. It also reminds us, right up to the meaningful folk ballad near the end, how dangerous political celebrity, fake populism and ostentatious greed can be for a nation, and how captivating.